After two recent disappointing encounters with fried ice cream at two different local Mexican restaurants, I decided the other day to take matters into my own hands. I've been meaning to do this for some time, and my craving for fried ice cream finally reached a fever pitch. I was compelled to do this, and today I am thankful that I both have the time and resources to do this for fun. I wouldn't say I've perfected this dish at all, but what you see above was infinitely more satisfying than the sad excuses I had at the restaurants--those tasted like they'd been fried days before I even got there. 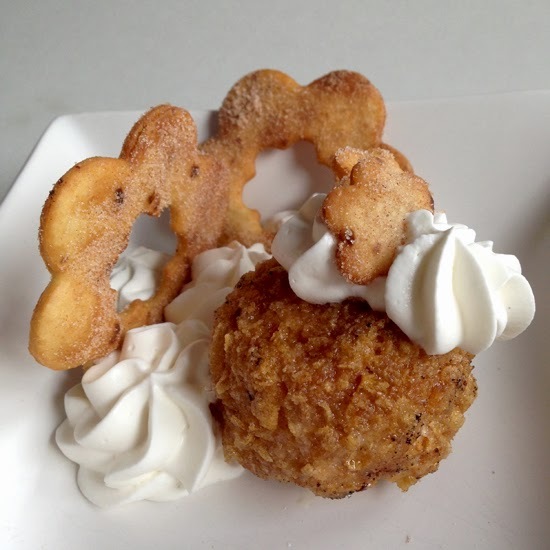 At any rate, this fried ice cream here is crisp on the outside, and very cold and vanilla-y on the inside. I used a vanilla bean ice cream, and I kind of think it might have been a mistake. I think I needed to go for a plain old vanilla ice cream to really get the taste I have in my mind of the perfect fried ice cream. I'll just have to try again sometime. I'm glad I took a few minutes to make the whipped cream to go with this too. For some reason, it balanced the flavors of the coating and the sweetness of the vanilla ice cream. I don't know why exactly, but it completed the dish for me. For my first attempt at frying these yesterday, I made a little chocolate ganache to go on top, but it ended up soaking into the corn flake exterior and just didn't look appetizing. It tasted good, but it was not very attractive for the pics here. So, there you go. My first (well, second) attempt at frying ice cream. Now when I get a craving for it, I know exactly what I need to do. When ice cream balls are firm, start prepping the coating. Place beaten eggs in a shallow bowl/dish. Crush corn flakes cereal until you have smallish pieces, but not pulverized. Mix in the 5 tablespoons sugar and 1/2 to 1 teaspoons cinnamon (depending on your preference for cinnamon). Prepare another baking sheet by lining it with wax paper. 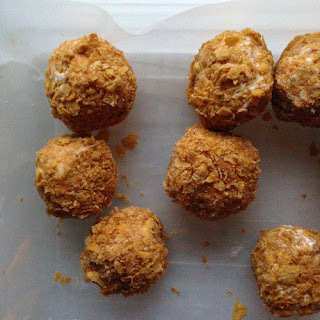 Working with one ice cream ball at a time, roll and press it into the corn flake mixture. Then roll it in the eggs to coat completely. 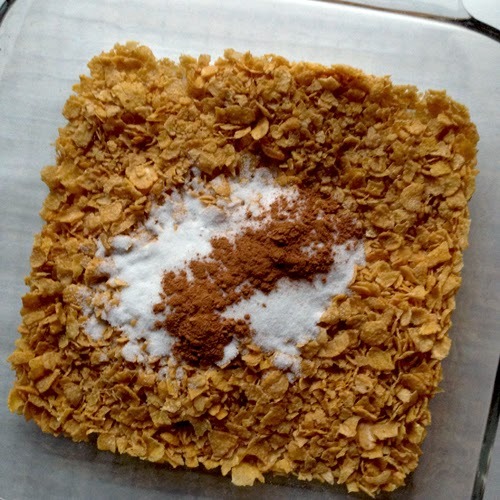 Roll in the corn flake mixture again, making sure to press the coating into the sides to get a nice solid coating. Place coated balls on prepared baking sheet and freeze overnight, until hard--like rock hard. Repeat with remaining ice cream balls. When coated ice cream balls are hard, leave in the freezer until ready to fry, and get the oil heated and cinnamon crispas made. Place about 3 inches of canola oil in a medium pot (not any kind of shallow pan--a cooking pot). Heat oil on a burner set to medium-high heat. Prepare a plate by lining it with paper towels (this is for the crispas). While oil heats, cut the tortillas for the crispas. I cut cute flower shapes today, but you can cut strips, or triangles--whatever works for you. Place a small tortilla scrap in the oil while it heats. When it starts to sizzle and brown, place another small piece in the oil. If it starts to sizzle right away, your oil is ready. Place a few tortillas in there to fry up golden-brown and crispy. Turn when edges are browned, and fry until deep golden brown. Remove to the paper towel lined plate and sprinkle immediately with cinnamon sugar, preferably on both sides. Repeat with remaining crispas. 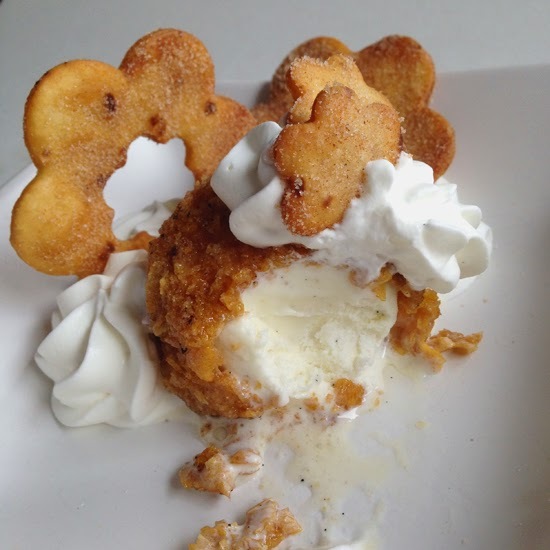 Once crispas are fried, set them aside and start frying the ice cream, one ball at a time. Leave remaining ice cream balls in the freezer while they wait their turn. 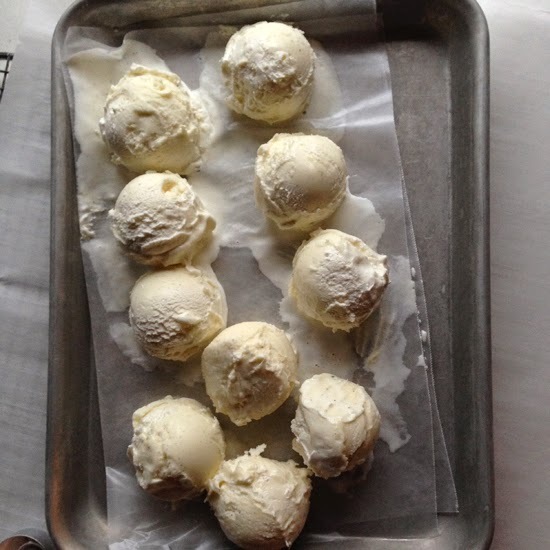 Carefully place a frozen coated ice cream ball into the hot oil and fry for only about 12-15 seconds, turning with a slotted spoon to fry all sides. Remove with a slotted spoon to a paper towel to drain momentarily before putting in a bowl to serve. 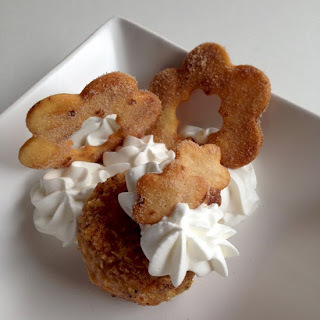 Top with whipped cream and cinnamon crispa.